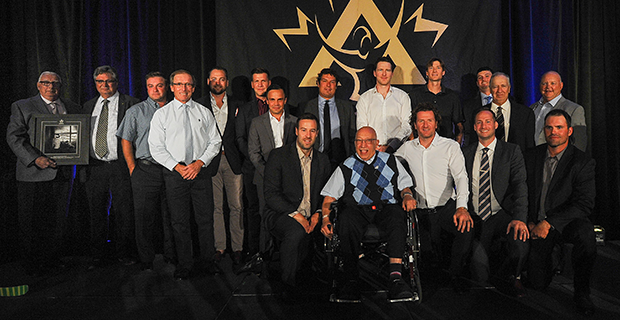 A who’s-who of hockey has been inducted into the Alberta Hockey Hall of Fame. 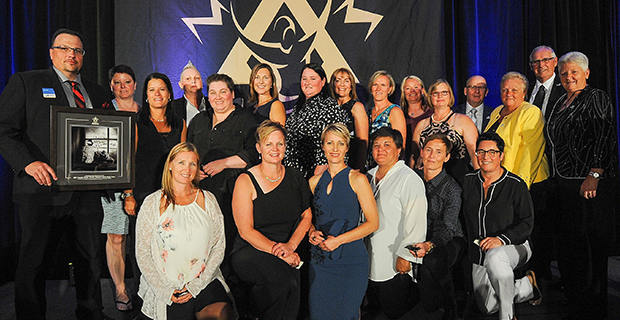 Grant Fuhr, coach Wally Kozak, Mike Vernon, broadcaster Ron MacLean and two Canada Winter Games gold-medal winning teams — 1991 Team Alberta Female and 1999 Team Alberta Male — were enshrined at the AHHF Awards Gala held July 22 at the Coast Hotel in Canmore. For the inductees, their speeches provided an opportunity to reflect on those who had an impact not just on their playing careers, but also their lives. The reverence Wayne Gretzky reserves for the times he mentions Grant Fuhr’s name cannot be overstated. Fuhr is one of the National Hockey League's all-time greatest goaltenders, playing on five Stanley Cup-champion teams over a 20-year NHL career (1981-2000), and earning induction into the Hockey Hall of Fame in 2003 in his first year of eligibility. The Spruce Grove native is best known for his 10 seasons in net with the Edmonton Oilers (1981-91), where he was occasionally left all alone to rob counter-attacking forwards while his all-star skaters caught up on the back-check. An accomplished golfer, Fuhr’s also been known to win a skin or two on the course. 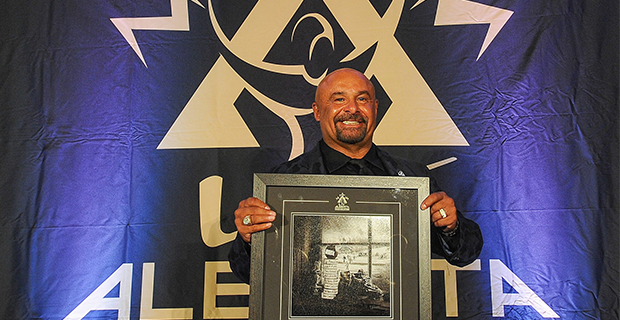 In his AHHF induction speech, Fuhr thanked some of the people who made his Hall of Fame career possible, including Spruce Grove Minor Hockey and the parents and volunteers who made playing Minor Hockey possible. He also made sure to mention the Oilers and then-head coach Glen Sather, who took a chance on a kid who was a little rough around the edges, and the Calgary Flames for allowing him to finish his career in Alberta. Wally Kozak is simply known in hockey circles as “Coach Wally.” From Bobby Hull’s era to today’s up-and-coming elite players, Coach Wally has overseen the progression of hockey training regimens and skills advancement over four decades at the rink. He’s known as one of the best technical hockey coaches on the planet. A career coach and past head scout and manager of player development for the Hockey Canada women's program, he’s been instrumental in developing female hockey in Canada because of his involvement at all levels of the sport. Look up the word “coach” in the dictionary, and you’ll find Kozak’s picture smiling back at you. Coaching, and its ever-improving results, have evolved demonstrably on Coach Wally’s watch. And he can name-drop with the best of them. 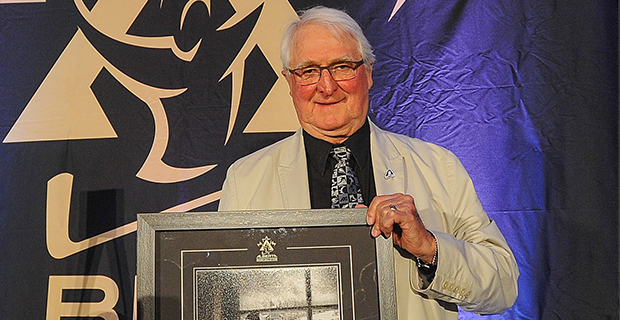 During his induction speech, Kozak acknowledged four significant individuals from Alberta who pioneered coaching development programs in Canada — Dale Henwood, Clare Drake, Dr. George Kingston and Dave King. He also talked about his one year with Father David Bauer's national team, and the influence Bauer had on the type of coach Kozak would become. Coach Wally still shares his knowledge and passion for the game today at hockey development camps in Cochrane, AB. Mike Vernon is a two-time Stanley Cup champion and a Memorial Cup winner, who played 19 seasons in the National Hockey League with four teams. The goaltender hoisted the Stanley Cup in 1989 with the Calgary Flames and in 1997 with the Detroit Red Wings. In his AHHF induction speech, Vernon recalled how he used to attend Coach Wally’s skills camps, and how he and Fuhr squared off not just in the NHL, but also in the WHL. Vernon extended thanks to his minor-hockey coaches and teammates throughout the years; talked about how then-Flames head coach, the late Bob (Badger) Johnson, made the game fun; and acknowledged the key roles played in his career by goaltending greats such as Glenn Hall, Dan Bouchard, Rejean Lemelin and Rick Wamsley. 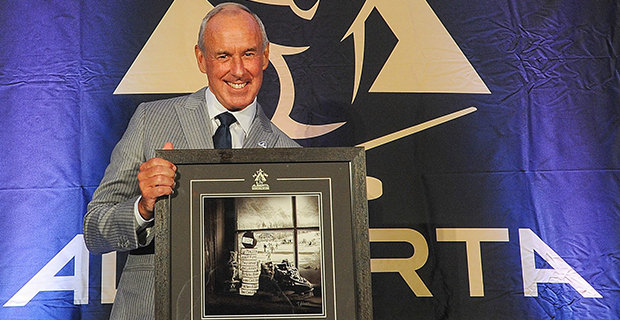 Over his television broadcasting career, Ron MacLean has interviewed the greatest players, coaches and personalities as a key member of Hockey NIght in Canada. His extensive knowledge and passion for the game of hockey, combined with three decades of hosting HNIC, have made him one of the country's most recognized sports broadcasters. 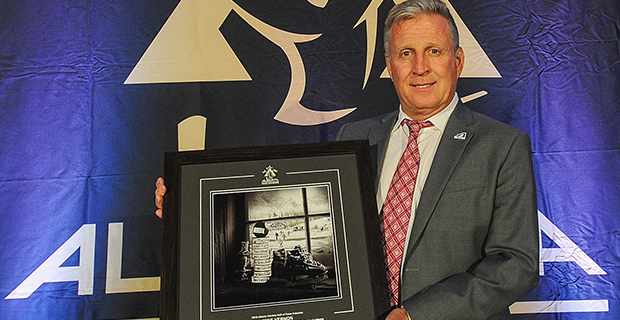 For MacLean, his AHHF induction provided a weekend full of memories, including recollections about each of the other members of the 2018 induction class — including the best save he ever saw from Grant Fuhr, during an exhibition tour in Norway, and Mike Vernon's performance in an exhibition game in the 1985-86 season against Moscow Dynamo. The 1991 Canada Winter Games in Charlottetown, P.E.I., marked the first year for female hockey at the Canada Winter Games. It was a record-setting performance for the players selected to the inaugural Team Alberta Female Hockey squad that won the gold medal, defeating British Columbia, 2-1, in the championship final. Loretta Normandeau, one of the team's assistant coaches, recalled the challenge in finding players to invite to the tryout camp. But the players on the team were truly trailblazers who have helped female hockey expand from the 120 players who attended that first provincial development camp in Lacombe to the more than 8,000 female players registered in 2017-18 in Alberta. The Team Alberta Male Hockey squad went undefeated in Newfoundland and Labrador at the turn of the millennium to win Alberta's third gold medal in male hockey in Canada Games competition. Ben Kilgour recalled how the team was a unique mix of players from different levels of hockey who had played against each other their whole careers, but came together as a team for the Games. Then, a fortunate puck bounce in overtime, "and (Scott) Hartnell sends us here today. It happens that quick." Kilgour thanked all the parents for their time and travel; the minor-hockey programs, coaches, managers, volunteers and junior programs that allowed their players to attend the Games; and Hockey Alberta for setting the professional hockey atmosphere and giving them the chance to know the thrill of victory. Alberta is hosting the 2019 Canada Winter Games beginning Feb. 15 in Red Deer, and the tryout list for the the province’s male squad includes 34 WHL prospects. Visit Hockey Alberta for in-depth bios of each inductee and information on the Hockey Alberta Foundation golf Classic, a key fundraiser for the Hockey Alberta Foundation’s Every Kid Every Community Program.